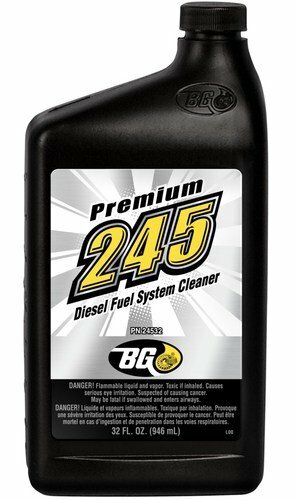 BG 245 Premium Diesel Fuel System Cleaner removes and dissolves deposits from the entire diesel injection system, including fuel injectors and combustion chambers. Diesel fuel is notorious for its instability. Without adequate fuel stability to control deposit formation, diesels are extremely sensitive to fuel breakdown. This can increase deposit buildup, leading to heavy exhaust emissions and power loss. In newer high pressure common rail (HPCR) direct injection engines, high temperatures and pressures can cause diesel fuel to breakdown into carbon deposits more quickly. The result is poor performance and potential engine damage. Current diesel fuel system cleaners remove deposits from the injector tip but fail to reach inside the injector itself. BG 245 removes and dissolves deposits from the entire diesel injection system, including inside fuel injectors and combustion chambers. BG 245 is especially effective in removing heavy deposits inside the injectors of high temperature, HPCR fuel delivery systems. Plus, BG 245 contains a fuel lubricity agent and cetane improver for cold starts. Improves cold start, lowers emissions, smoothes idle.